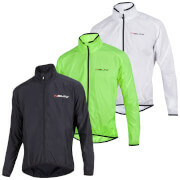 Designed to keep you dry in the wettest cycling conditions, the Castelli Tempesta Race Jacket has a lightweight and compact design for optimal aerodynamic performance. Made from ultra-lightweight eVent® fabric, the jacket offers full protection from wet weather with taped seams and breathable construction to keep you cool. The technical jacket features an incredibly stretchy fabric on the shoulders, elbows and side panels for full freedom of movement. 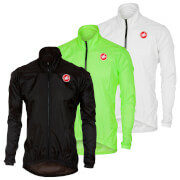 Fastened with a full waterproof Vislon® length zip, the jacket features easy opening cuffs and offers access to your jersey pockets without having to pull up the jacket. A silicone waistband prevents the jacket from riding up and the lower rear hem protects your back from spray. Complete with reflective trims for full 360° reflectivity and a small packaway design that can be stored in a jersey pocket. – A.D.
After reading other reviews I had really high hopes for this jacket and wasn't disappointed. It has, in fact, exceeded my expectations. 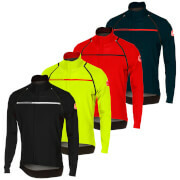 The fit is fantastic for racing, it keeps you warm when it's cold, dry in the rain and looks amazing as well. It is really light and crushes down small if no longer needed on a ride. The large back pockets are excellent too. All in all, my favourite jacket ever and hard to imagine how it could be better.